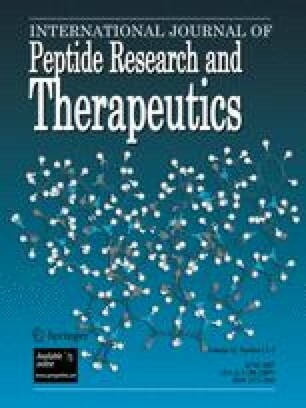 Based on the 3D structure of the WW domain of human Yes-associated protein (hYAP-WW) in complex with a proline-rich peptide ligand, we have designed and synthesized a cyclic peptide covering a fragment of hYAP-WW that contains its primary contact residues for the interaction with the ligand. This peptide was found to specifically recognize a proline-rich ligand for hYAP-WW. Its conformation was calculated using molecular dynamics simulation, based on long-range NOEs identified by NMR spectroscopy, and indicates an arrangement of primary contact residues similar to hYAP-WW. We thank Christel Kakoschke and Victor Wray for assistance with NMR spectroscopy. This work was supported by the BioFuture Program (Grant No. 0311882) of the German Federal Department of Education and Research (BMBF), the German National Science Foundation (DFG We 1863/10-2) and the Kurt Eberhard Bode Foundation. We acknowledge a grant from the Barcelona Supercomputer Center.